Criticism is a vital aspect to career development. However, many of us are closed off to because truth be told, it is hurtful. It reminds us that we are imperfect, a fact that most of us want to forget. However, because it is important for our career development, and because we will always receive it as people will not always agree with our way of doing things, it is important that we learn how to professionally deal with it. You don’t want to start having a screaming match with your boss just because they have criticized you or worse, you don’t want to begin to sob because you think your boss has been too harsh in their criticism. So, how do you deal with criticism? The first step to doing so is being open to it. The website, howtodothings.com/careers points out that we ought to remember that we are not perfect and other people may not view things as we view them so we should be open to criticism. Being open to criticism means that we should also be open to listening to it. In cases where we think our critics are making important points that can enable us to improve, then it is important for us to implement them. The website advises us to desist from thinking that criticism is a personal attack. “Separate work objectively from subjective personal emotions,” reads part of the article on managing criticism. Criticism directed at one’s output should not be bogged down to an attack on one’s personality. A winner mindset is another piece of advice that the website mentioned earlier on gives. Often, when we are criticized, we forget our worth. We think we are losers even when our past records show that we are not. It is important for us to remember that we are winners prone to making mistakes. This way, we will not be brought down by criticism. Instead, we will learn from it. Appreciating criticism is the final advice the website dispenses. Often, people criticize so we become better so it is important for us to appreciate this. This enables us to be open to criticism and to act on it. It also helps us act professionally when we are criticized. In turn, we earn the respect of our subordinates. 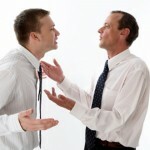 Defensiveness must be avoided when dealing with criticism. This is because it hinders objectivity which in turn hinders us from taking away good advice that might have been dispensed with criticism. Asking questions, according to a career counselor for www.accounting.smartpros.com is another way of effectively utilizing criticism. Asking questions about points of criticism that one has not understood enables one to make improvements that one’s critic deems necessary. Explaining one’s rationale, according to www.accounting.smartpros.com, to one’s critic also clears up the air. One may feel that one is being unjustifiably criticized and when one points out one’s rationale, the weight is lifted off that person’s chest. It also gives the critic a view of where one is coming from. Handling criticism professionally albeit hard is possible. In whatever one does, one must ensure that no hard feelings arise and stay awakened as a result of criticism received. Imagine a perfect world. Now imagine the part you would like to play in the creation of that perfect world. Do something today to further that goal.